The purpose of this article is to keep the reference guide clean and managable. There is alot of additional and pertinant information that was felt deserving of it's own reference. This elusive label has gone undiscovered until June 21, 2011, when it was brought to my attention from a collector whom would like to remain anonymous. 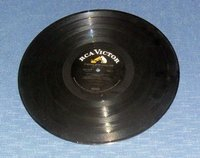 It is identical to the mega rare Black label, RCA logo is white, other label print is silver, however, it is not rigid, but flat. A label that is more consistant to the orange labels of 1968-1970. I have identified this label as 1964, since that was the year of introduction. This particular copy would more likely to have been pressed in 1968 around the time of transition to the newer orange label. 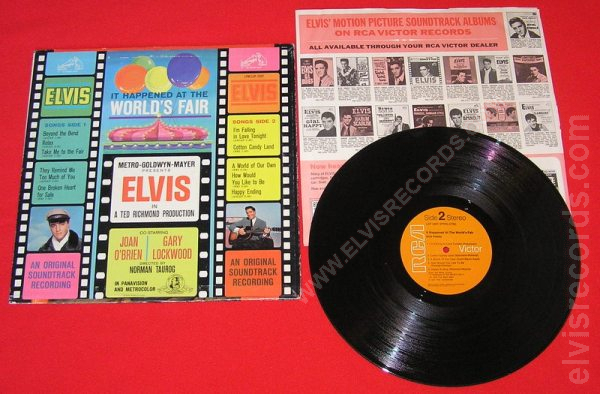 ELVIS PRESLEY LSP-2697 *IT HAPPENED AT THE WORLD'S FAIR* RECORD ALBUM. 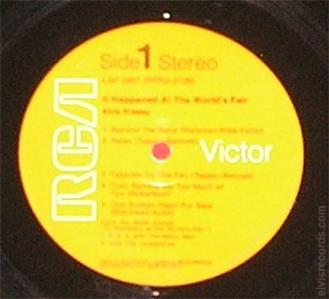 ANY BRIGHT WHITE SPOTS ARE FROM THE FLASH OF THE CAMERA AND ARE NOT ON THE VINYL. 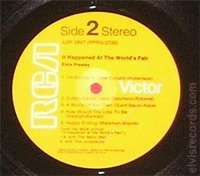 The reference images below are what was used to painstakingly create the mockup images provided in LSP-2697 It Happened At The World's Fair. These images are as close to the originals as possible, you be the judge. This inexplicable rarity was hidden away for 40 years and was not known to exist until this discovery. 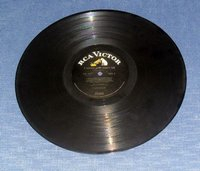 These are the images of the actual non-flexible orange label release that was auctioned on eBay on March 1, 2008. 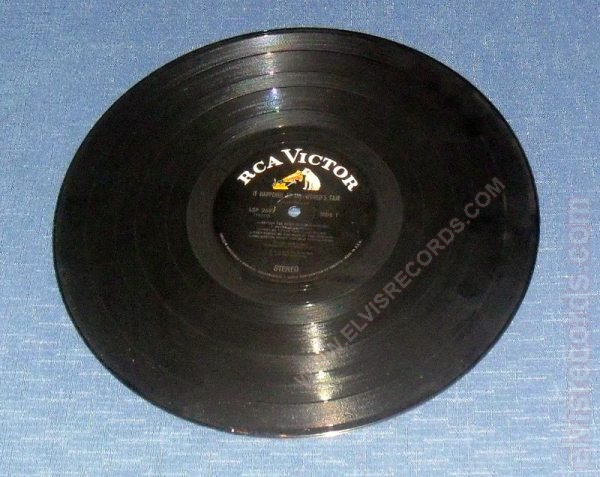 Here is one for the ultimate Elvis collection, MEGA RARE, never identified in any price guide before, not known to exist! 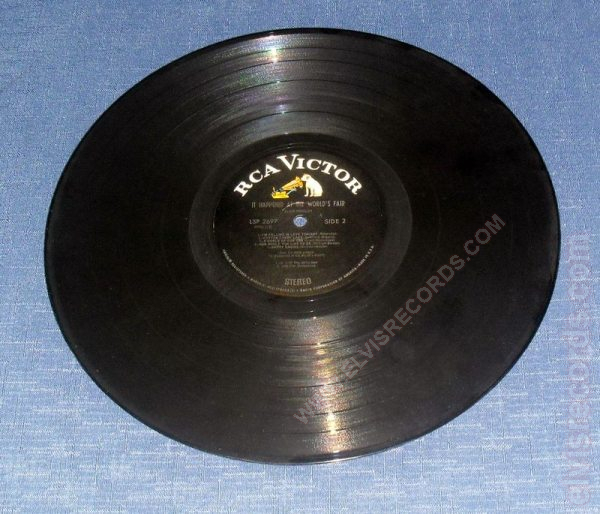 I was stunned when I picked this up in a collection a few weeks ago, I have always looked for the rigid vinyl orange label and simply like other collectors believed it did not exist! Well here it is!! This cover is the same cover that was used in earlier variations and it is in very nice shape, does have some light edge wear, but very nice look and feel to it. 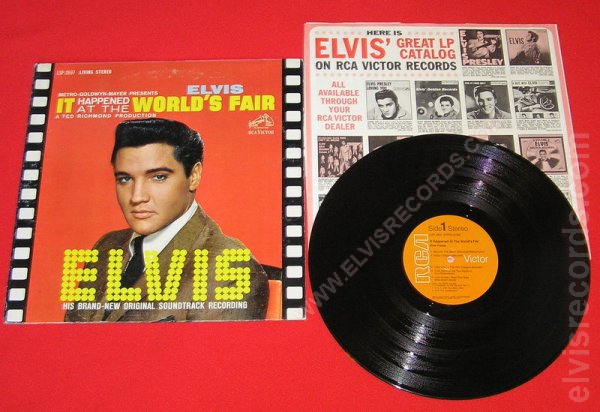 The record is the value here and it is stunning, just mint in every way, the labels are stunning, the vinyl looks to have never been played. If you want to own something that very few if any collections have, THIS IS IT! I don't know if we will see another, but the RIGID VINYL ORANGE LABEL "It Happened at the World's Fair" US release does exist!